ACE M4 SOCOM Long Length Buttstock. The strongest production AR15/M16 stock available! Approximately 6 times stronger than an AR15 A2 stock & receiver extension tube. 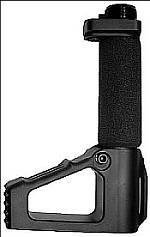 Ideal for CQB or breaching doors, without the fear of bending the receiver extension tube. Adjustable length of pull, adjusts from 7.5" to 9.5" (standard version) or 9.5” to 11.5” (long version) in five 1/2" increments. Closed-cell foam overtube provides an extremely comfortable cheek weld.